The best parts of summer are relaxing and eating food by the pool. Greek yogurt mixed into dips is a perfect way to fulfill both requirements while still being somewhat healthy. With yogurt dips, the possibilities are limitless; almost anything goes good with a dip! This flavorful black bean, lime, and honey, Greek yogurt dip is a delicious treat for the long hot days of summer. 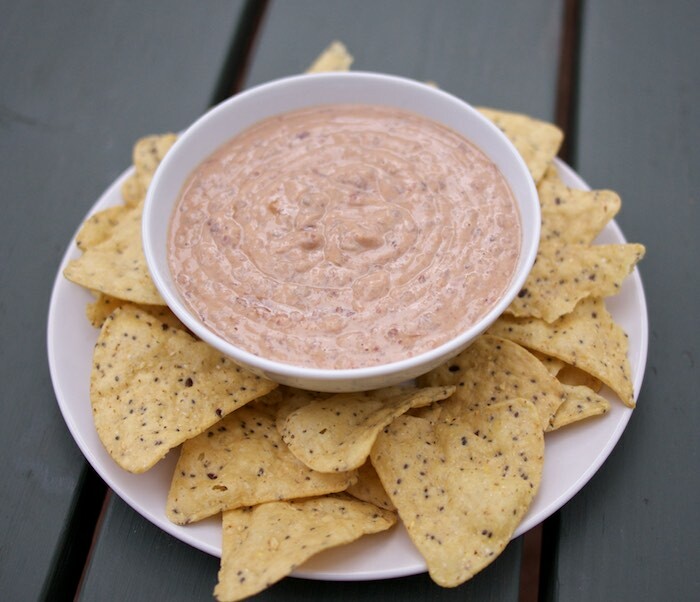 The dip tastes great with salty foods like tortilla chips and pretzels, and equally as good with fresh veggies. It’s refreshing to eat on a hot summer day and is quick and easy to make as a snack or appetizer. Plus, using Greek yogurt in dips rather than mayonnaise or sour cream makes them healthy and delicious. Add this dip to your poolside menu this summer. Place the beans, salsa, Greek yogurt, lime juice, honey, cumin, chili powder, and garlic powder in the bowl of a food processor and process until smooth and creamy. Serve with your favorite chips or fresh veggies. What did we do before Greek yogurt?! It's perfect in just about everything! Perfect for an afternoon by the pool! Swimming makes me super hungry anyways so I know I'd be ready for chips and dip! Yum, I love the flavors in this dip! Oooo - this sounds fantastic! I think I have all of the ingredients to make this dip this weekend! I love the way the Greek yogurt lightened up this bean dip - it looks like perfect poolside munching material! Oh yes, this would be perfect for poolside snacking, preferably with a margarita in the other hand! This looks like such a delicious, lighter black bean dip! Definitely perfect for summers at the pool. I LOVE the idea of this dip, I'll be packing it up for the beach this week. This looks tasty. I'll need to try it! Oh man! That honey lime dip looks so good. Definitely need to try this.